Charles Leclerc was cruelly robbed of victory in Bahrain after an engine cylinder failure, but he can seek redemption at the Chinese Grand Prix. As that call on the radio to say there was a problem with the engine came through, many hearts died along with that cylinder knowing that a stunning drive from a remarkable young driver was going to end in tragedy. The crumb of comfort came in the Safety Car which arrived after Renault’s double retirement. 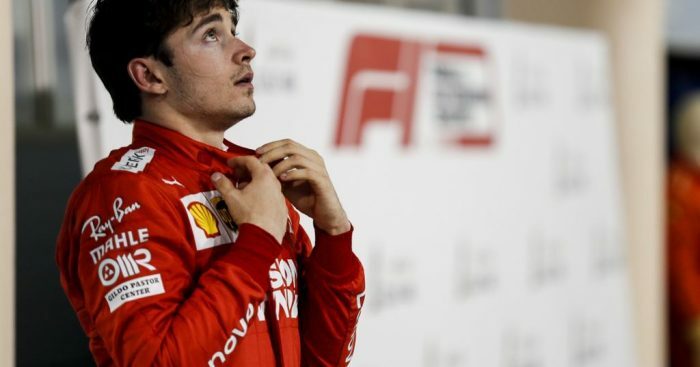 That would allow Leclerc to keep his Ferrari ahead of Max Verstappen and cling on to P3, but that podium spot felt empty to say the least. But, what cannot be questioned is the 21-year-old’s positive attitude. He accepted disappointment, shrugged it off and already is looking to the future, and his stage to put things right arrives at the Chinese Grand Prix. “We are seeing a young champion in the making” was the words of rival Mercedes boss Toto Wolff. Round three of the 2019 championship and the 1000th Grand Prix takes place at the Shanghai International Circuit, a track that is 5.451 kilometers long and in Turn 1 and 2 has arguably one of the more difficult corner combinations on the Formula 1 calendar, comparable to that of Istanbul Park’s Turn 8, which is another Hermann Tilke designed track. It’s a circuit where, while passing isn’t easy, it isn’t impossible. In 2011 Mark Webber race from 18th on the grid without KERS to finish second, right behind team-mate Sebastian Vettel. This venue also provided Michael Schumacher with the final victory of his Formula 1 career in 2006. The Bridgestone intermediates struggled on a damp Shanghai track, with the legendary German qualifying in P6. It was all change in the race though, as the seven-time champ cut through the field on a drying track, and when Giancarlo Fisichella emerged from the pits and immediately slid wide at turn 1, Schumi came through to take his 91st and final victory in the sport. It was Vettel who put the Ferrari on pole here last year, but it’s not a track the Scuderia enjoy – Mercedes have won every race here bar 2018 in the V6 era. Speaking of Vettel, it’s ten years since he won his first and only Chinese GP, and the German must use China as an opportunity to silence the critics following that unforced error in Sakhir – let’s hope Verstappen doesn’t shunt him in Shanghai this time around. It was the 32-year-old’s latest spin when under pressure from Lewis Hamilton which once again drew the ‘Vettel cracks under pressure’ detractors out from under their rocks, and Seb needs to put them back there before he becomes the forgotten one, rather than the chosen one at Ferrari. As for our race winners in Bahrain – Mercedes, well they either have to solve their pace issues or hope for the gods to take their side again in China. Hamilton himself has spoken of how lucky the Silver Arrows were to win in Sakhir – and he tells no word of a lie. Luck isn’t exactly a faithful friend for the Brit in that part of the world. Unlike many generic tracks, this one punishes mistakes as there are plenty of gravel traps, and who can ever forget 2007 where a then-rookie Hamilton slid into the pit-entry gravel trap in the tricky conditions after McLaren had delayed pitting him. It would allow Kimi Raikkonen to stay in the title fight and ultimately go on to become World Champion. Red Bull are another team looking for pace – Verstappen ran a lonely race at the Bahrain International Circuit. He was clear of the midfield, but nowhere near the top four – his hopes for better pace on the medium tyres didn’t come to fruition. “It’s a tricky car at the moment,” said team principal Christian Horner, but it’s a bull they need to tame quickly if they are to deliver on their pre-season hype of a title challenge. They took the chequered flag in Shanghai with Daniel Ricciardo last year after an impressive call on tyre strategy, the Austrian team will look to capture lightning in a bottle again. Indeed, Ricciardo joins Hamilton, Vettel and Raikkonen as the only drivers on the 2019 grid who have won at this track. So, will Ricciardo claim consecutive wins with his new employers? We doubt it. Why? – Renault’s double-retirement in Bahrain. It really was a bizarre Formula 1 moment as both Ricciardo and Nico Hulkenberg dropped out at the same time from points-paying positions on lap 55. That marked back-to-back retirements for Ricciardo, and these kind of stats are just no good for a Renault team who were looking to build on their best-of-the-rest status in 2019. Ricciardo has said that the team will come to China armed with an upgrade to fix that dodgy engine, it will be interesting to see how effective it is. But, you get the impression their issues run deeper than a quick-fix. It was their customer team who had one of the brightest showings in Bahrain – that being McLaren. Lando Norris followed up another strong qualifying performance with P6 in the race. He promised us he would soon match his race with his qualifying form, and it sure didn’t take long for him to deliver. In fact, both McLaren’s made it into Q3 for the first time since 2017, and Carlos Sainz would have been right up there with his rookie team-mate in the race if he hadn’t have collided with Verstappen in the early stages. While the focus will be on what’s happening at the top, McLaren will certainly be in the corner of viewers eyes – can they repeat their form at the Shanghai International Circuit? From a neutral point of view, we hope so. Another team who the neutral would like to see hit a bit of form are Williams, but still we are seeing very little sign of this. They remained comfortably off the pace throughout the race weekend in Bahrain, though a positive could be found in Robert Kubica who was much closer to his team-mate George Russell this time around. Russell will return to the Williams cockpit in China armed with the experience of a testing day with Mercedes where their development driver finished fastest on day 2, but it will take a lot more than that to relieve his struggling 2019 employers of their flaws.